Students will be able to write a persuasive letter. Students will be able to use future tense verbs when writing about how their lives will be. Have students close their eyes and visualize their lives at age 25. Have students open their eyes and share their thoughts with a partner. Tell students that a lot of decisions need to be made to get them to the lives of their dreams. They need to learn how to be successful at their dream job, they need to receive the appropriate training/education, and they would benefit from having the support of their family members. Brainstorm what a supportive family would look like and how they could help students achieve their dreams (they could support students when in school, provide encouragement so students believe they can do anything, etc.). Tell students that they will write a letter to their parents telling them how they want their lives to be at age 25 and how their parents can support them to get to this point. Model how to write the letter. Focus the first paragraph on describing the ideal life and the second paragraph on persuading parents how they can support the ideal life. Tell students that they should prepare to email the letter to their parents, so they’ll need to come up with a descriptive title for their letter. Model how to create a title and write it above your letter. Have students look back on the letter you wrote and take turns circling all the verbs. Talk about how the verbs are all Future tenseAnd review the simple future tense (will ____). 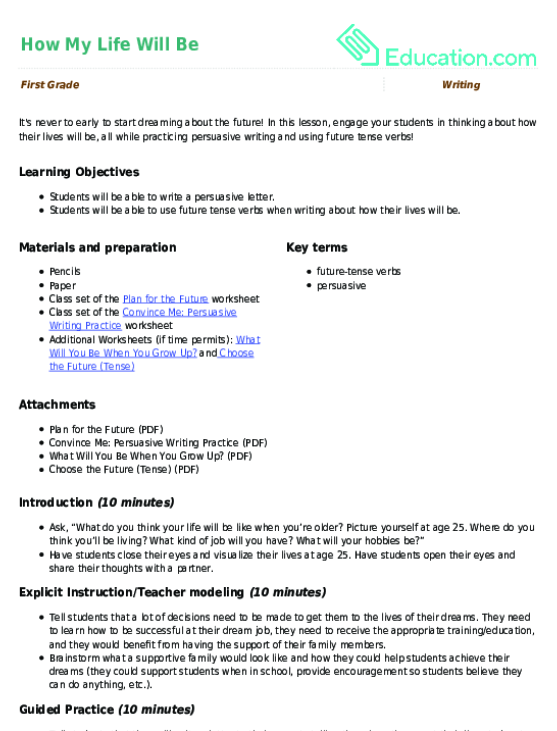 Hand out the Plan for the Future and Convince Me: Persuasive Writing practise worksheets to the students. Have them begin by writing down their ideal life at age 25 using the Plan for the Future worksheets. Students can then write their letters using the structure on the Convince Me: Persuasive Writing practise worksheet. Support: Help students transfer their work from the Plan for the Future worksheet to the Convince Me: Persuasive Writing practise worksheet. This will cut down on the original writing they’ll need to do for their letters. Enrichment: Have students complete the additional worksheets: What Will You Be When You Grow Up? and Choose the Future (Tense). Assess students’ understanding by noticing how they use persuasive writing and future verb tenses in their letters. Have students share their writing with a partner. If time permits, ask for a few students to share their work with the entire class. In this lesson, engage your students in thinking about how their lives will be, all while practising persuasive writing and using future tense verbs! Students practise using future tense verbs when imagining what their lives will be like at age 25. After imagining what their lives will be like at age 25, students write persuasive letters to their parents asking for their support. 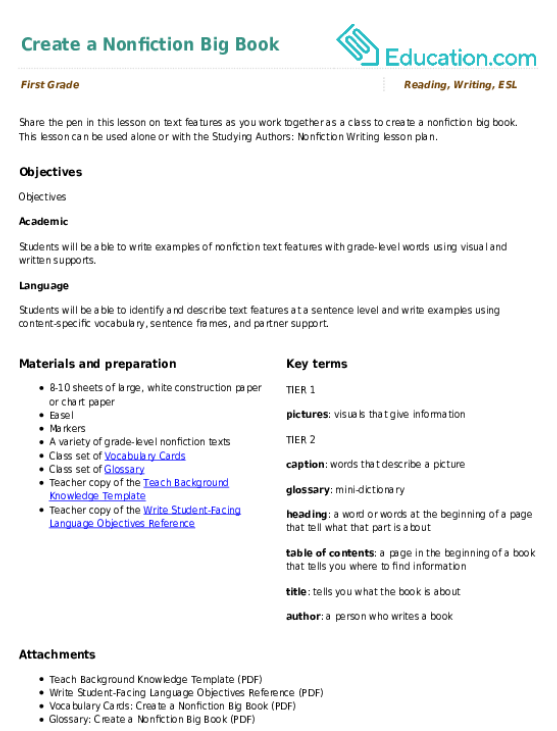 This lesson can be used alone or with the Studying Authors: Nonfiction Writing lesson plan. Young writers will love using this planning sheet to plan out their setting, characters, problem, solution, and choose a title. Young writers will love using this planning sheet to plan out their very own fairy tale. It includes sections for planning the characters, setting, and three parts of the story. Students will also plan an important character and surprising plot moment in their stories!